ROCHESTER, N.Y., Jan, 22, 2007 -- Researchers have made an optics breakthrough that allows them to encode an entire image's worth of data into a photon, slow the image down for storage, and then retrieve the image intact. While the initial test image consists of only a few hundred pixels, the researchers said a tremendous amount of information can be stored with the new technique, which was developed at the University of Rochester. 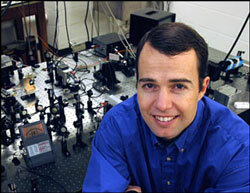 University of Rochester associate physics professor John Howell in the lab. He and his research team have stored an image on a single photon and retrieved it intact. The image, a "UR" for the University of Rochester, was made using a single pulse of light, and the team can fit as many as a hundred of these pulses at once into a tiny 4-in. cell. Squeezing that much information into so small a space and retrieving it intact opens the door to optical buffering -- storing information as light. "It sort of sounds impossible, but instead of storing just ones and zeros, we're storing an entire image," said John Howell, associate professor of physics and leader of the team that created the device, which is revealed in today's online issue of the journal Physical Review Letters. "It's analogous to the difference between snapping a picture with a single pixel and doing it with a camera -- this is like a 6-megapixel camera." "You can have a tremendous amount of information in a pulse of light, but normally if you try to buffer it, you can lose much of that information," said Ryan Camacho, Howell's graduate student and lead author on the article. "We're showing it's possible to pull out an enormous amount of information with an extremely high signal-to-noise ratio even with very low light levels." Howell's group used a completely new approach that preserves all the properties of the pulse. The buffered pulse is essentially a perfect original; there is almost no distortion, no additional diffraction, and the phase and amplitude of the original signal are all preserved. Howell is working to demonstrate that quantum entanglement remains unscathed. 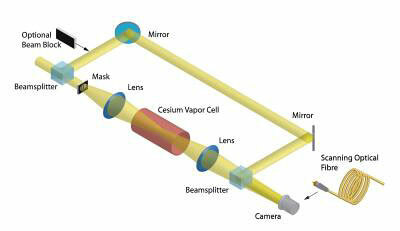 Experimental setup for the delay of transverse images. Light pulses of 2 ns duration are incident on a 50:50 beamsplitter. The transmitted pulses then pass through an amplitude mask and a 4f imaging system. The transmitted and reflected pulses are recombined at another 50:50 beamsplitter. The transmitted part traverses a path approximately five feet shorter than the reflected path, and arrives at the second beamsplitter about 5 ns sooner than the reflected pulse, preventing interference between the two pulses. The temperature of cesium vapor can then be adjusted to give 5 ns of delay, resulting in interference. In the low-light-level experiment, the pulses are attenuated such that each pulse contains on average less than one photon and the reflected path is blocked. A scanning optical fiber is used to collect the photons in the image plane and the photon arrival times recorded using a photon counter with time-to-digital converter. To produce the UR image, Howell simply shone a beam of light through a stencil with the U and R etched out, turning down the light so much that a single photon was all that passed through the stencil. Quantum mechanics dictates some strange things at that scale, so that bit of light could be thought of as both a particle and a wave. As a wave, it passed through all parts of the stencil at once, carrying the "shadow" of the UR with it. The pulse of light then entered a 4-in. cell of cesium gas at a warm 100 °C, where it was slowed and compressed, allowing many pulses to fit inside the small tube at the same time. "The parallel amount of information John has sent all at once in an image is enormous in comparison to what anyone else has done before," said Alan Willner, professor of electrical engineering at the University of Southern California and president of the IEEE Lasers and Optical Society. "To do that and be able to maintain the integrity of the signal -- it's a wonderful achievement." Howell has so far been able to delay light pulses 100 ns and compress them to 1 percent of their original length. He is now working toward delaying dozens of pulses for as long as several milliseconds, and as many as 10,000 pulses for up to a nanosecond. "Now I want to see if we can delay something almost permanently, even at the single-photon level," says Howell. "If we can do that, we're looking at storing incredible amounts of information in just a few photons."